Hello! I’m so excited to be sharing my first blog post today as a member of The Little Paper Tree DT, so I’m starting with a little bit about me. I’m Claire, I live with my husband and 5-year-old daughter in South Wales, and I work as a television subtitler. I grew up crafting with my mum (she’s also an awesome cardmaker and passionate crafter) and I’ve carried on ever since! I mainly make cards, but also love scrapbooking, mixed media, and crafting with my daughter. I have an addiction to buying ink, paints and stencils, and love getting my hands dirty. But my absolute favourite thing to do is put on Netflix in my craft room in the evenings and colour cute stamped images with my Copic markers! 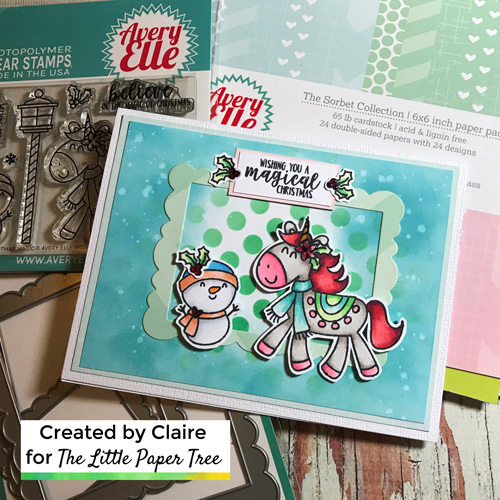 In honour of World Cardmaking Day last Saturday, The Little Paper Tree are hosting a Christmas cardmaking challenge, enter your card here for a chance to win a voucher for the store! For my Christmas card inspiration, I have used a stamp set from the new release by Avery Elle. Unicorns definitely aren’t traditionally Christmassy, but they sure are fun to colour and my daughter most definitely approves! To make the background I first applied Lucky Clover Distress Oxide through a polka dot stencil. Then blended from the edges with Broken China Distress Oxide. I flicked on some water droplets and left it to dry. I think it looks a bit like a snow blizzard! I mounted the background onto some blue paper and stuck to my card front. This was a really fun background to create, and I’m all about the fun! I die-cut a wonky frame from some blue stripy paper and stuck that in the centre (I always just use Glossy Accents as an adhesive for this). I stamped and coloured the images with Copic markers, then fussy-cut them out. The unicorn and snowman are stuck on with foam pads for some dimension. My sentiment was stamped in black, then mounted onto a scrap of pink paper and stuck at the top of the frame. I added some finishing touches with a glitter pen, Glossy Accents and holly leaves. The holly on the snowman is hiding a blemish on the hat where my ink bled a bit, shh! Thanks for visiting my project on today’s blog, and I can’t wait to see your Christmas card entries for the challenge!